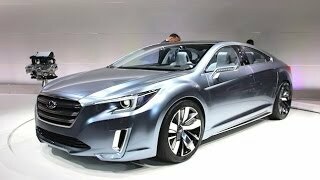 Subaru will have the public debut of the Subaru Legacy Concept at the 2013 Los Angeles Auto Show later this November. 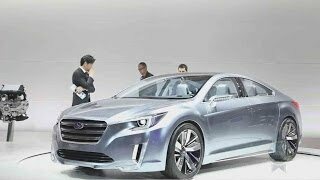 The Legacy Concept celebrates the 25th anniversary of the Subaru Legacy. 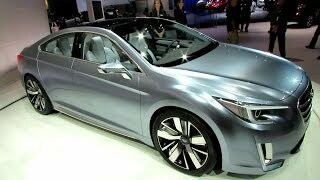 It comes with a custom Ocean Silver Metallic paint and features a coupe-like silhouette. It has a new hexagonal grille and a sharper hawk-eye headlamp design. 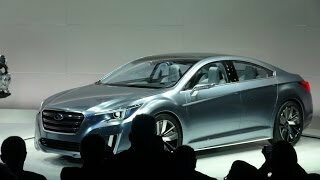 Flared wheel arches cover 21-inch wheels and hint at the standard Subaru Symmetrical all-wheel drive drivetrain. Detailed information will be available on debut….